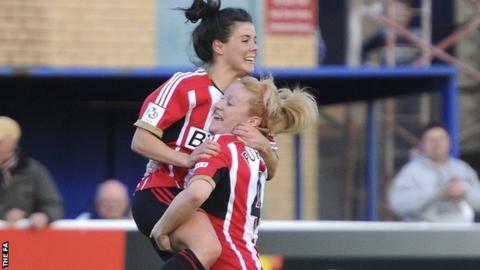 Sunderland scored three first-half goals to beat Birmingham in Women's Super League One at the Hetton Centre. The hosts opened the scoring in the first minute when Beth Mead surged into the box to fire past Sophie Baggaley. Brooke Chaplen doubled their lead on the half hour, smashing into the top corner after good play from Mead. Sunderland made it 3-0 just before half time, Victoria Greenwell scoring with a direct free kick after Birmingham's Kerys Harrop had fouled Rachel Furness. In the second half, Birmingham's Kirsty Linnett headed directly at Rachael Laws from close range, while Harrop saw her effort cleared off the line, while Sunderland failed to add to their first-half goals. Linnett had to be helped from the field 15 minutes from time after suffering an ankle injury following a collision with Sunderland's Greenwell. The victory sees Sunderland climb to third in the WSL 1 table, while Birmingham go into the international break without a victory in the league so far this season. "We wanted to start off well and keep a clean sheet and that's what we've done. We're proving why we should be in this league. "I don't think we played pretty football at times, it was a bit scruffy. "But it's nice to win and get that before the break. We're now in a good position for the second half of the season." "I'm disappointed with the result but in the first half I thought we were really good. They've had four efforts on goal and scored with three of them. "We've had four or five efforts and we've not taken any of them, but that's football. "It's a cruel, cruel game and we've been punished for not taking our chances." Sunderland: Laws, Holmes, Williams, Sharp, Greenwell, Joice (Kelly 68), McDougall, Furness, Chaplen (Gutteridge 82), Ramshaw (Bass 89), Mead. Subs not used: Harkness, Wilson, McFadden, Hill. Birmingham City: Baggaley, Westwood, Mannion, Harrop, Carter, Moore (Windell 86), Potter, Carney (Haines 74), Linnett (Allen 76), Ayisi, Lawley. Subs not used: Torkildsen, Weston.